If the universe is a library, I can't find the catalogue. What does it mean for a thing to be sacred? At Fred Clark’s blog slacktivist (the motto of which is, “Test everything: hold on to what is good”), there has been an argument over the definition of the words holy and sacred. In “If nothing is sacred, then everything is for sale,” the first of the three posts over which this argument so far stretches, Clark discusses Lawrence M. Krauss’s article in The New Yorker, which argues among other things that science is fundamentally atheistic because it holds no ideas as sacred; Clark disagrees, on the grounds that Krauss’s use of the word sacred is incorrect. In science, of course, the very word “sacred” is profane. No ideas, religious or otherwise, get a free pass. The notion that some idea or concept is beyond question or attack is anathema to the entire scientific undertaking. This commitment to open questioning is deeply tied to the fact that science is an atheistic enterprise. And “sacred” does not mean that something “is beyond question.” It means that something is beyond price. Sacred means more than that. It means we’re talking about something that cannot be bought and sold — something for which the very idea of price would be obscene. To say that nothing is “sacred,” then, is to say that everything is for sale. This is not just a deeply cynical thing to say about the world, but a bitterly cynical thing to say about oneself. Clark goes on to argue that science’s process relies on this sense of the sacred, on the fact that scientists are unwilling to sell their integrity. It is an interesting and clever argument, but almost certainly a flawed one. The argument in the comments (which, I admit, I only skimmed) seems to have two prongs: first, Clark’s definition is no less strange than Krauss’s; second, Clark appears mean-spirited, obtuse, or untypically dogmatic in this post. I’m not concerned about the second issue, but the first interests me. 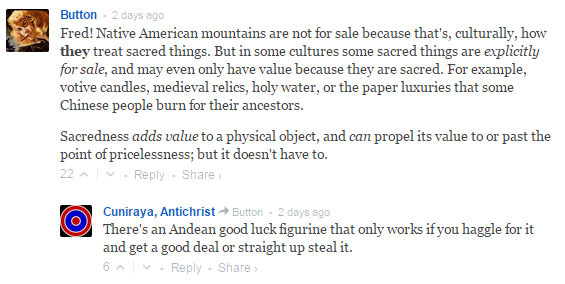 The commenters have offered a wide variety of senses of the words sacred or holy, and have given numerous examples of sacred things that are for sale: votive candles, charms which are only said to be operative when purchased (or stolen), and holy relics. Clearly the words sacred and holy mean various things to various people. Both Krauss’s definition and Clark’s suffer the same fault: they are definitions at all. A definition tries to pin onto a word a stable, abstracted meaning. Determining a denotative meaning for a word can be a useful thing to do, but it is also an artificial thing to do. Single, stable, common meanings are not the way of words. Words are dynamic and idiosyncratic. Sacred means something to me because it has a particular history to me; I’ve heard it used in various ways, and I’ve had success (and failure!) using it in various contexts in particular ways. Your history with sacred has been different from mine, so you will understand that word differently. In many cases, our histories with certain words and combinations of words are so similar that we can say that there is consensus on the meaning of the word, and not be too wrong about that. In other cases, though, histories are very different. (As a professor I had once put it, people’s linguistic careers are idiosyncratic and always developing.) This is something I should have discussed in my post on the definition of religion: there is something fraught about definitions, not just definitions of religion in particular. Definitions are excellent for creating a common basis for conversations, and it is necessary to answering questions precisely—Is the world itself sacred? Does Confucianism count as a religion, or does liberal Christianity? *—but definitions need to be established in common before they can be useful. Krauss and Clark have very different histories with those words, I suspect. On that note, I’d like to share some of my own history with the words holy and sacred. In particular, I have read Paul Tillich’s Dynamics of Faith, which has since then charged and animated my own attitudes towards religion. In the book, a primer in the philosophy of religion, Paul Tillich describes the experience of the holy by drawing on Rudolph Otto’s formulation of the numinous, an attribute of something that might be sacred, haunted, fey, or cursed. Otto said that the numinous was mysterium tremendum et fascinans: it is something which is wholly other (mysterium) and provokes both terror (tremendum) and fascination or attraction (fascinans). Tillich understands this to mean that the holy is the experience of what he calls the Ultimate, and this experience of the holy has two possible components or types: the holy of what is affirms the present, indicates a positive relationship between the Ultimate and the space, person, or situation; the holy as judgement over what is judges the present, makes obvious the ways in which the space, person, or situation do not measure up. For Tillich, a complete religion will contain both components, but most religions prioritize one of the two over the other. According to Tillich, the Ultimate—what most would call God—is that which is not conditional (or dependent, or contingent) on anything else. This is a fairly conventional conception of God (Creator and Sustainer), though it is articulated in philosophical terms not many are familiar with: God does not so much exist as allow other things to exist, to create the conditions of existence. Hence the term Ultimate or Ground of All Being. The Ultimate’s unconditional nature means that human symbols for God can never fully or accurately describe it; therefore, according to Tillich, every person who truly recognizes, or wishes to recognize, God’s unconditional nature must also be willing to recognize the inadequacy and inevitable error of their symbols for God—which include creeds as well as rituals. To Tillich, dogma is therefore antithetical to a proper, dynamic, fully aware relationship with God. Or, to put it in terms of the holy: a sacred experience will both affirm the present (after all, one exists, and God is that according to which one can exist) and critique the present (after all, an experience of the Ultimate should illuminate our own fallibility). The experience of the sacred or holy, properly understood, means, in Krauss’s words, that no “idea or concept is beyond question or attack [… . ]” A sacred idea is not one you are unwilling to reject; a sacred idea ought to be one which you are very willing to reject, since it is about the Ultimate and therefore it certainly requires revision. Of course Krauss is unlikely to be familiar with Tillich’s theology; I seem to recall Clark also admitting he was unfamiliar with Tillich’s theology, put off as he was by elements of Tillich’s biography. ** I therefore do not anticipate that this idea—that sacredness or holiness, in its experience of other-ness (mysterium), is antithetical to dogma—is one Krauss or even Clark would be likely to consider. Tillich’s use of the word is not part of their linguistic careers, as it is part of mine. I therefore cannot prescribe this meaning of the word. However, I will note that as a critique of Krauss’s use of the term, Tillich’s use is even more pointed than Clark’s. Moreover, the slacktivist tagline is, “Test everything: hold fast to what is good”; that seems close to the holy of what is and the holy as judgement over what is to me. We can try and choose better and better definitions, though. People do have experiences for which they use the word holy or sacred; what formulation would best capture those experiences? Certain ideas get a free pass? Certain things cannot be bought or sold? Or mysterium tremendum et fascinans? Something else entirely? Feel free to discuss your own idiosyncratic careers with the words holy and sacred in the comments. * Liberal Christianity does not refer simply to Christianity that is leftist, but rather to a form of Christianity in the 19th and 20th centuries which tended to read the Bible as an anthology of the author’s experiences, beliefs, and feelings, in their own historical and cultural context, and not as a set of propositions or facts. Paul Tillich was a liberal theologian. ** This is less petty than it sounds: one of Clark’s primary theses at slacktivist is that American evangelical Christianity was crafted deliberately in order to support the practice of slavery. While it may no longer support slavery, in its very core evangelical Christianity—its literalism, its otherworldliness, its distaste for the world at large—still contains those elements crafted to fit and endorse a slave state. Therefore Clark is always suspicious of forms of religion arising from situations or persons that seem politically and (in his view) biblically untenable. As a hermeneutic, this seems very useful; I do not know if it is reliable. This entry was tagged definition work, literary theory, religion. Bookmark the permalink. Can You Be Too Open-Minded?